Good knots are easy to tie, are easy to untie, and hold well. A good knot will not untie itself. In sailing vernacular, a knot is used to tie a line back upon itself, a bend used to secure two lines together, and a hitch is used to tie a line to a ring, rail or spar. A knot used to secure a line to an object, such as a ring or eye, is a hitch. The knots listed below are those most commonly used in boat operations. A figure eight knot is an overhand knot with an extra twist. It will prevent the end of a line from feeding through a block or fairlead when loads are involved. It is also easier to untie and does not jam as hard as the over hand knot. This knot resembles a figure eight and is also known as a stopper knot. 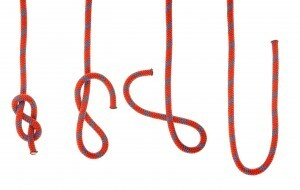 Called a square knot by Boy Scouts, the reef knot is one of the most commonly used knots in marlinespike seamanship. Reef knots are primarily used to join two lines of equal size and similar material. Reef knots do not effectively hold two lines of different sizes or diameter. Caution should be used if the line is going to be under heavy strain since the reef knot can jam badly and become difficult to untie afterwards. 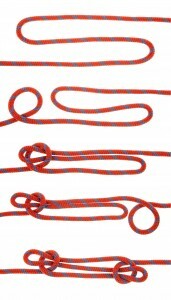 Reef knots are best used to finish securing laces (canvas cover, awning, sail to a gaff, etc. ), temporary whippings, and other small stuff. The sheet bend also known as becket bend is a bend that joins two lines that are if unequal size and diameter together. It is the best knot for attaching a line to an eye splice and can be easily taken apart even after being under a load. When tying the sheet bend the running parts should be left long because there is some initial slip in the knot when the knot is first brought under tension. The sheepshank is a type of knot that is used to shorten a rope or take up slack. This knot is not stable. It can easily just fall apart under too much load or too little load. The bowline is a versatile knot and can be used anytime a temporary eye is needed in the end of a line. It also works for tying two lines securely together, though there are better knots for this. An advantage of bowlines is that they do not slip or jam easily.